Trend Def Studios owner and head engineer Mike Gonsolin (seated) and production partner Vision (standing), in their Hollywood, California facility. Trend Def Studios has acquired a majority of their gear from the Sherman Oaks location of GC Pro. WESTLAKE VILLAGE, CA, June 29, 2011 — Production duo Mike Gonsolin and Vision at Trend Def Studios in Hollywood, California, have come to appreciate the prompt response of their go-to audio equipment dealer, Guitar Center Professional (GC Pro), the outside sales division of Guitar Center that focuses on the needs of professional users. Working with Paris Hilton one day and scoring for a television show the next, it’s not unusual for Gonsolin and Vision to have an urgent need for a piece of hardware or software, and the Account Managers at GC Pro's Sherman Oaks location are invariably ready to respond immediately. Trend Def Studios, located just off of hip Melrose Avenue, is a one-stop shop capable of handling writing, production, tracking, editing, mixing and mastering. The centerpiece of the very well equipped facility is an Avid Pro Tools|HD5 rig with a laundry list of plug-ins, soft synths and sample libraries, racks of new and vintage analog and digital outboard processing, and a live room fully stocked with instruments, amplifiers and stompboxes. “I probably have gotten 70 to 80 percent of my studio through GC Pro,“ reports Gonsolin, who has been shopping with the retailer for over a decade. Aside from Pro Tools, the room also features ADAM Audio S3A monitors and a Sub10 subwoofer controlled by a Crane Song Avocet and, in addition to outboard processing, stacks of sound modules from companies such as E-MU, Korg, Moog, Novation, Oberheim, Roland and Waldorf. “We have maybe 40 different analog sound modules. We run the Shadow Hills Mastering Compressor, we have a Dangerous 2-BUS analog summing mixer and a ton of compressors. Although we don’t mix into a board we’re known for having extremely analog sounding, in-the-box mixes here,” he says. Trend Def Studios music clients include Cisco and Shwayze, Megan McCauley (Gonsolin and Vision are working on her sophomore album), Paris Hilton, The Veronicas, Sam Adams and numerous others. Several record labels are currently bidding to sign Gonsolin’s solo project, Trend Def, from which he has already placed a song in a major motion picture, and a music video has been produced for Trend Def’s song “Perdition.” Gonsolin is also currently scoring for Nickelodeon’s “Supah Ninjas” show. For more information, please visit http://www.trenddefstudios.com/ and www.gcpro.com/. 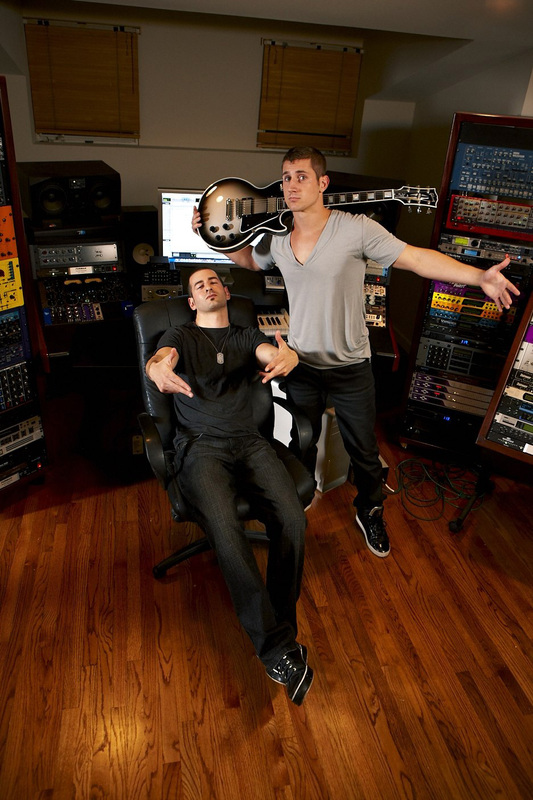 Photo Caption: Trend Def Studios owner and head engineer Mike Gonsolin (seated) and production partner Vision (standing), in their Hollywood, California facility. Trend Def Studios has acquired a majority of their gear from the Sherman Oaks location of GC Pro. Guitar Center is the leading United States retailer of guitars, amplifiers, percussion, keyboards and pro-audio and recording equipment. Our retail store subsidiary operates 219 Guitar Center stores across the United States. In addition, our Music & Arts division operates 101 retail stores specializing in band and orchestra instruments for sale and rental, serving teachers, band directors, college professors and students. We also are the largest direct response retailer of musical instruments and related products in the United States through our wholly owned subsidiary, Musician’s Friend, Inc., and its catalogs and owned or operated websites. More information on Guitar Center can be found by visiting the Company’s website at www.guitarcenter.com.